Supports Digestive Tract Function and Nutrient Absorption. A broad-spectrum multiple enzyme formulation that contains 7 digestive enzymes along with ox bile, pancreas substance and betaine hydrochloride. 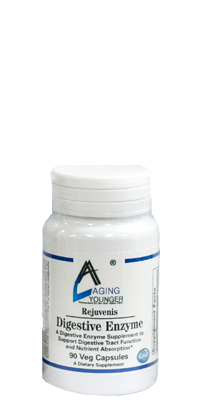 Each enzyme in our Rejuvenis Digestive Enzyme Ultra works on a specific substance in the body. As a dietary supplement, take one tablet with each meal, or as directed by your healthcare practitioner. Caution: For adults only. Consult physician if pregnant/nursing, taking medication, or have a medical condition (especially Galactosemia). Keep out of reach of children. For adults only. Consult physician if pregnant/nursing, taking medication, or have a medical condition (especially Galactosemia). Keep out of reach of children.